Add value to your property and have the room you always promised yourself. The Prefab Garden Room provides the retreat that you need to get away from the day-to-day. A music room? Home office? Reading room or just a den… the uses are endless. The building is totally maintenance free with White PVCu doors, windows and frames, you don’t have to spend time treating and painting. Supplied as standard as an Apex roof building, you can change the roof colour, or you can upgrade to an Apex 15 or Apex 20. Enhance the appearance of your Concrete Garden Room and Building with our range of wall finishes. Choose from our patented sectional Brick and Stone factory applied finish, our site applied Textured finishes that give you the appearance of a rendered wall, or Garaclad, our timber effect textured PVCu cladding. 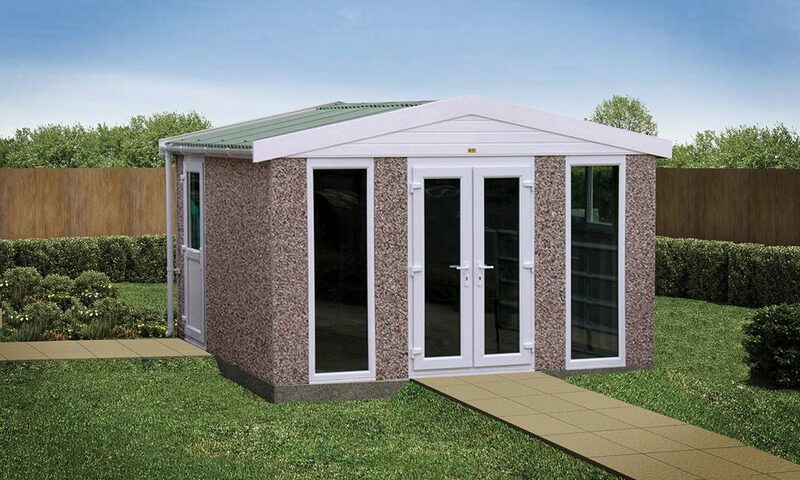 Decograin PVCu units add a level of sophistication, blending in with your property, and the PVCu units can be used to provide a double aspect to your Prefab Garden Room. Ask your agent how to line and insulate your building using our lining clip options. He may well be able to offer the service direct. The Lidget Design & Build service ensures that if you don’t see what you want, we can design it for you – Speak to your local agent. White PVCu patio double door, two white PVCu full height glazed units. 12.5° pitch roof with Spanish Red fibre cement roof sheets (with a choice of a further 5 colours), eaves filler. 15° pitch roof with Bold Roll fibre cement roof sheets in terracotta, eaves filler. or a traditionally constructed 20° pitch fully lined roof with Metrotile Galvanised steel pantile roof tiles in a choice of 6 colours. White PVCu gutters to both sides. For the full range of PVCu units, sizes and prices ask your Agent. You can also choose from a wide selection of materials and colours, so your garden building will match your existing house or surroundings.